With the perception of crime still high in Guyana, Opposition MP and former security minister, Clement Rohee, has called for Public Security Minister Khemraj Ramjattan to declare to the people whether he has lost the war on crime. 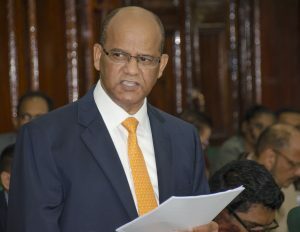 Rohee asked how the police force could guarantee order in society when “they don’t have order in their own house.” The Opposition MP said the infighting has sent signals to the criminal underworld. “Criminals seem to have better intelligence than the law enforcement. They seem to know where the money is, where it is coming from, which bank, and where it is going,” Rohee continued. Rohee called for an independent survey on crime to complement the crime rate survey conducted by the Guyana Police Force. Rohee went on to challenge government’s focus on oil and gas saying it “has gone down the same road which some oil-producing nations have gone down before depending on oil over agriculture saying it cannot develop aspirations as a nation.” Rohee linked this to what he called government’s attempt to place the sugar industry on the chopping block. Natural Resources Minister Raphael Trotman stood in challenge to Rohee’s statement saying he is not fairly representing his words. Speaker of the National Assembly, Dr Barton Scotland, warned MP Rohee to avoid doing same.